A private, 7-day mobile safari for adventurous families revealing Northern Botswana’s unique mix of stunning landscapes. Covering considerable distances, the tour’s primary focus is on thrilling game drives, with some water-based activities included. Arid plains, forests and sparkling waterways teeming with game and spectacular birdlife are there to be explored, with a dedicated camp team on hand to relocate the tented accommodation as the journey progresses. If budget and time allows, we recommend extending to include a couple of relaxing nights at Victoria Falls after your safari. Fly from Maun to Kwhai on a small aircraft flight. On arrival at the Khwai Game Reserve, guests settle in to camp, meeting their private guide and dedicated camp team. 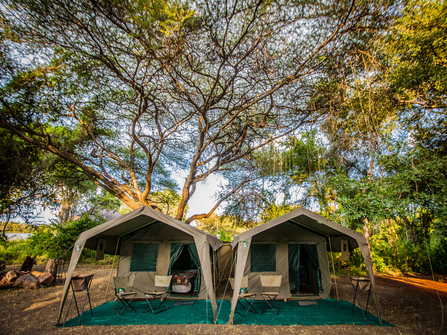 The meru-style family tents are carefully designed with interlinking parent and child sleeping quarters, and falling asleep to the sounds of the bush is a delight. Embark on the first day of vehicle safari in this beautiful private concession located in the north eastern Okavango, adjacent to the Moremi Game Reserve. There’s a fascinating mix of habitats to explore, from mopane forests and riverine woodland, to stunning palm islands and lily-lined lagoons. Lion, hyena, wild dogs, leopard and cheetah roam here, along with buffalo, wildebeest, kudu, giraffe and zebra. The huge concentrations of migrating elephant are a particular delight, and the birdlife is spectacular. Back at base, relax and enjoy being looked after by the dedicated camp team. Most of today is spent enjoying a game drive en-route from the Khwai concession to Chobe National Park’s wild and remote Savute Game Reserve. Zebra, wildebeest, giraffe, kudu, impala and buffalo graze here, and Savute’s tall, shady forests are home to entertaining troops of baboon. Historically an arid area, the main feature of this mysterious landscape is the ephemeral Savute Channel which has recently begun flowing again, bringing the plains to life. Vast numbers of elephant congregate at the water holes, sightings of lion and hyena are common and, if lucky, cheetahs, leopards and wild dogs may also be spotted. A full day to enjoy thrilling game-viewing in the Savute Channel. Most of today is taken up with an engaging vehicle safari as the tour progresses northwards to the beautiful Chobe Waterfront Game Reserve. A full day’s safari on the Chobe Waterfront in the beautiful north-eastern corner of the immense Chobe National Park. While the waterfront can become busy, your expert guide will know how to avoid the crowds. Chobe wildlife is superb with hippo, elephant, leopard, waterbuck, spotted hyena and buffalo here in abundance, along with huge prides of lion. Home to amazing birdlife, this is a photographer’s paradise. The tour itinerary is flexible, with potential opportunities for boat cruises and catch-and-release fishing (seasonal). Back at camp, enjoy a final evening of being well looked after by your private team. Today, bid your guide and team farewell in Kasane. If time and budget allows, we recommend extending to include 2/3 nights in Victoria Falls which is only an hour's drive away from Kasane. The starting point for this safari is Maun and the finish point is Kasane. South African Airways and Air Botswana both serve Botswana (Maun and Kasane) from Johannesburg (daily) and most international travellers will fly into Johannesburg and connect either same or next day to Botswana. There are also less frequent services available into Botswana from Cape Town and Nairobi. 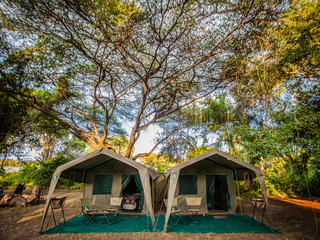 Fully serviced camping in walk-in Mini Meru tents (4 x 3 m) with two bedrooms, interconnecting bathroom, two ensuite bush showers and bush toilets. 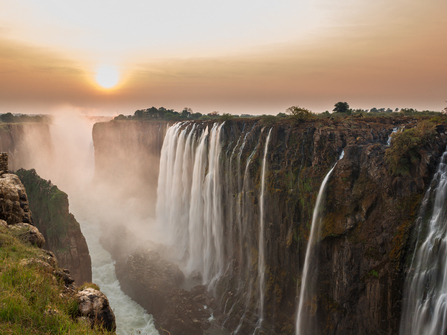 This itinerary is possible year round, peak times are from about May until the end of October, which is the best time for game viewing and viewing the Falls with medium - high water levels. There are pros and cons to a mobile safari vs a fly in fixed camp/lodge based safari. The biggest compromises inherent in the mobile safari approach are the levels of luxury and driving times between locations. 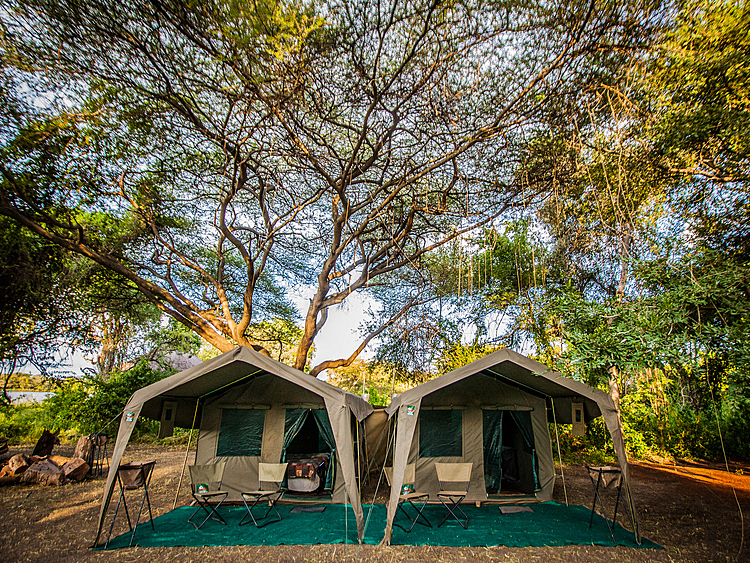 On the other hand a lightweight mobile camp setup put up less barriers between you and the wilderness in keeping with the traditional safari ethos and you get to see more of the country. Another advantage of a mobile safari is that mobile guides tend to be the stars of the industry, with the job requiring greater skill and experience than a camp based guide. It can also work out considerably better value for a family of four or more with the cost of the staff / vehicles etc. split across the group. We would usually recommend this kind of safari to more adventurous families. 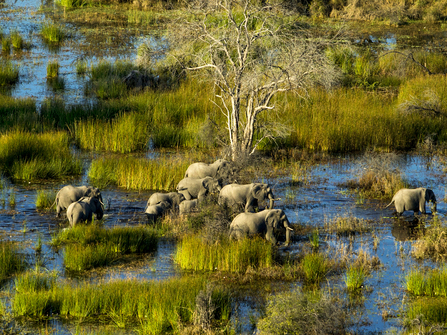 8 day safari combining Botswana's Chobe National Park, Zimbabwe's Hwange National Parks and Victoria Falls, areas renowned for their significant elephant populations and superb game viewing.